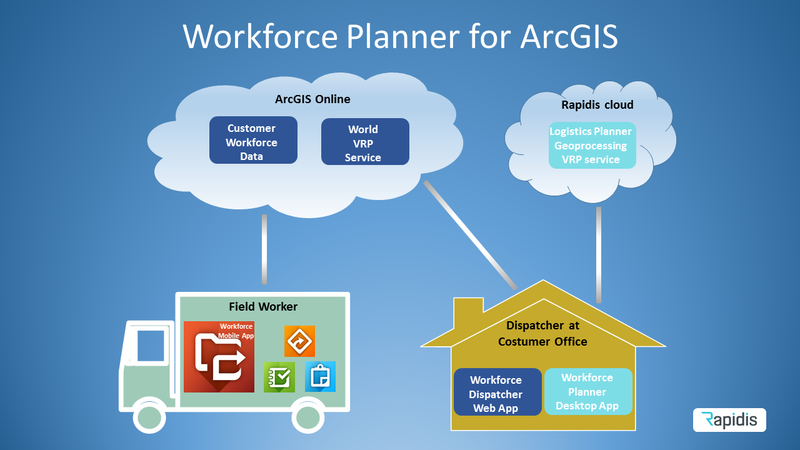 Esri has recently released the App Workforce for ArcGIS. Workforce is part of your ArcGIS Online subscription. Workforce makes it easier to organize field workers, assign tasks and get status information back into the office. Workforce works great in combination with one or more of the other Esri Apps like Navigator, Collector and Survey. In the office you will use the Workforce Dispatcher Web App. From here you can assign tasks to individual field workers. This is a manual process. This is why Rapidis has launched an App, Workforce Planner, that combines all the properties of Workforce with functionalities for automated scheduling and fleet optimization that you might allready know from the Rapidis Logistics Planner suite. In every day life this means that the dispatcher can select some or all tasks from the pool together with a number of field workers and then leave it to Workforce Planner to build the best and most cost efficient overall schedule that states which tasks should bee assigned the individual field workers together with the optimized sequence for each route. More information about Workforce Planner. Get your free trial on Workforce Planner at ArcGIS Marketplace.